Clerical marriage is the practice of allowing clergy (those who have already been ordained) to marry. It is a practice distinct from allowing married persons to become clergy. Clerical marriage is admitted in Protestantism, Anglicanism, Lutheranism, some Independent Catholic churches (not in communion with Rome), Islam, Judaism, Hinduism and the Japanese sects of Buddhism. The Eastern Orthodox, Oriental Orthodox, and Eastern Catholic Churches, while allowing married men to be ordained, do not allow clerical marriage after ordination. Their parish priests are most often married, but must marry before becoming ordained as priests—although they can get married while still attending the seminary. However, married priests in these Churches cannot be further ordained as bishops. There is no dispute that at least some of the apostles were married or had been married: a mother-in-law of Peter is mentioned in the account in Matthew 8:14, Mark 1:29-34, Luke 4:38-41 of the beginning of Jesus' ministry. 1 Timothy 3:2 says: "an overseer (Greek ἐπίσκοπος) must be ... the husband of one wife". This has been interpreted in various ways, including that the overseer was not allowed to remarry even if his wife died. Some scholars hold that a tradition of clerical continence existed in early Christianity, whereby married men who became priests were expected to abstain from sexual relations with their wives. In this view, the early Church did not consider legitimate marriage by those who were already priests. The Council of Elvira, a local synod held in Hispania Baetica (part of modern Andalusia) in 306, before Constantine had legitimized Christianity, made it an explicit law that bishops and other clergy should not have sexual relations with their wives. The church canons known as the Ecclesiastical Canons of the Holy Apostles, which appear to have been composed in Syria or Egypt slightly earlier have also been interpreted as imposing a similar obligation. 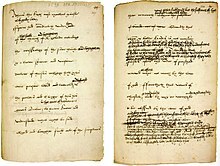 Evidence for the view that continence was expected of clergy in the early Church is given by the Protestant historian Philip Schaff, who points out that all marriages contracted by clerics in Holy Orders were declared null and void in 530 by Emperor Justinian I, who also declared the children of such marriages illegitimate. Schaff also quotes the account that "In the Fifth and Sixth Centuries the law of the celibate was observed by all the Churches of the West, thanks to the Councils and to the Popes. In the Seventh and down to the end of the Tenth Century, as a matter of fact the law of celibacy was little observed in a great part of the Western Church, but as a matter of law the Roman Pontiffs and the Councils were constant in their proclamation of its obligation." This report is confirmed by others too. "Despite six hundred years of decrees, canons, and increasingly harsh penalties, the Latin clergy still did, more or less illegally, what their Greek counterparts were encouraged to do by law—they lived with their wives and raised families. In practice, ordination was not an impediment to marriage; therefore some priests did marry even after ordination." "The tenth century is claimed to be the high point of clerical marriage in the Latin communion. Most rural priests were married and many urban clergy and bishops had wives and children." Then at the Second Lateran Council of 1139 the Roman Church declared that Holy Orders were not merely a prohibitive but a diriment canonical impediment to marriage, therefore making a marriage by priests invalid and not merely forbidden. Here is must be pointed out that 1054 is the year of the great East–West Schism between the Church of Rome and the four Apostolic sees of the Orthodox Communion (Constantinople, Alexandria Egypt, Antioch Syria, and Jerusalem). As stated above, the majority of Roman Church Priests at that time were married. Therefore, when some churches that followed western rites and traditions were brought back into communion with the Orthodox Churches beginning in the 20th century, their right to have married clergy, provided they were married before ordination, was restored. 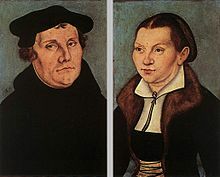 The practice of clerical marriage was initiated in the West by the followers of Martin Luther, who himself, a former priest and monk, married Katharina von Bora, a former nun, in 1525. It has not been introduced in the East. In the Church of England, however, the Catholic tradition of clerical celibacy continued after the Break with Rome. Under King Henry VIII, the 6 Articles prohibited the marriage of clergy and this continued until the Articles were repealed by Edward VI in 1547, thus opening the way for Anglican priests to marry for the first time. Generally speaking, in modern Christianity, only Protestant and some independent Catholic churches allow for ordained clergy to marry after ordination. However, in recent times, a few exceptional cases can be found in some Orthodox churches in which ordained clergy have been granted the right to marry after ordination. Following the example of Martin Luther, who, though an ordained priest, married in 1525, Protestant denominations permit an unmarried ordained pastor to marry. They thus admit clerical marriage, not merely the appointment of already married persons as pastors. But in view of 1 Timothy 3:2 and 3:12, some do not admit a second marriage by a widowed pastor. In these denominations there is generally no requirement that a pastor be already married nor prohibition against marrying after "answering the call". Being married is commonly welcomed, in which case the pastor's marriage is expected to serve as a model of a functioning Christian marriage, and the pastor's spouse often serves an unofficial leadership role in the congregation. For this reason, some Protestant churches will not accept a divorced person for this position. In denominations that ordain both men and women, a married couple might serve as co-pastors. Certain denominations require a prospective pastor to be married before he can be ordained, based on the view (drawn from 1 Timothy 3 and Titus 1) that a man must demonstrate the ability to run a household before he can be entrusted with the church. Even in these strictest groups, a widower may still serve. This again concerns marriage before appointment as pastor, not clerical marriage. The Eastern Orthodox, Oriental Orthodox, and Eastern Catholic Churches permit married men to be ordained. Traditionally however, they do not permit clergy to marry after ordination. From ancient times they have had both married and celibate clergy (see Monasticism). Those who opt for married life must marry before becoming priests, deacons (with a few exceptions), and, in some strict traditions, subdeacons. The vast majority of Orthodox parish clergy are married men, which is one of the major differences between the Orthodox and Roman-Catholic churches. Yet as stated above, their marriage must have occurred before ordination. Since the marriage takes place when they are still laymen and not yet clergy, the marriage is not a clerical marriage, even if it occurs while they are attending the seminary. Clerical marriage is thus not admitted in the Orthodox Church—unlike most Protestant Churches. Traditionally, even if the wife of a married deacon or priest dies, he may not remarry but must remain celibate. However, in recent times, some Bishops have relaxed this tradition and allowed exceptions here. For one, a widowed priest may be granted relief from the obligation of celibacy through a process known as being laicized. Their subsequent marriage is thus seen as the marriage of a layman, and not clerical marriage. After the marriage, the former Priest may then apply for re-ordination. A subdeacon or hypodeacon is the highest of the minor orders of clergy in the Orthodox Church. This order is higher than a reader but lower than a deacon, the latter being a major order of clergy. Subdeacons are mentioned in canons with prohibitions on marriage after ordinations (like deacons and priests) - e.g., Apostolic canon 26. Frequently today however, a variety of methods of dealing with these canons have been employed, therefore allowing subdeacons to marry. One method has been to bless acolytes or readers to vest and act as a subdeacon temporarily or permanently. This creates a new distinction between a 'blessed subdeacon', who may not touch the altar or assume other prerogatives of ordained subdeacons outside services, and an 'ordained subdeacon'. Another method is to reserve the formal ordination service to later. This situation often arises if there is a need for a subdeacon and a likely candidate has stated an intention to marry but has not yet done so, causing a delay in his ordination. Still in some cases today, the canons are simply ignored here, therefore permitting even formally ordained subdeacons to marry. Generally, if a deacon or priest divorces his wife, he may not continue in the ministry. Yet even here a few exceptions can be found. For one, if the divorce is deemed the fault of the spouse and occurs within the acceptable guidelines laid out in the new testament of the bible. Bishops are elected from among those clergy who have chosen, usually by taking monastic vows, to remain celibate, or from widowed clergy. If a widowed priest is elected bishop, he must take monastic vows before he can be consecrated. The Eastern Catholic Churches, in full communion with the Pope, follow much the same tradition as the Orthodox. The Latin Church of the Roman Catholic Church generally follows the discipline of clerical celibacy: as a rule, only unmarried or widowed men are accepted as candidates for ordination. An exception to this practice appears in the cases of married non-Catholic clergymen who choose to become Catholics and who seek to serve as priests. The Holy See has at times granted dispensations from the usual rule and allowed such men to be ordained. 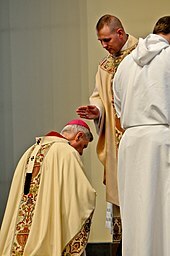 For example, some former Anglican priests and some former Lutheran ministers have been ordained to the priesthood after being received into the Church. Starting in 2010, the establishment of Catholic Personal ordinariates for former Anglicans has added to such requests. As in the Orthodox Churches, occasionally Catholic priests receive dispensation from the obligation of celibacy through the act of being laicized, either at the request of the priest, or as a punishment for a grave offense. A subsequent marriage is thus seen as the marriage of a layman, not a clerical marriage. In contrast to the Orthodox practice, such a married former priest cannot apply to be restored to priestly ministry while his wife is living. Despite the Roman Catholic Church's position, several Catholic priests have lived in a "married state" (though not officially married) throughout the centuries. The Eastern Catholic Churches allow the ordination of married men as priests. However, like the Orthodox and Latin Catholic Churches, they do not allow clerical marriage. A unique question arises when celibate Catholic Priests have converted to become Orthodox Priests. Do the Orthodox believe that Roman Catholic priests have the grace of the priesthood (and thus RC priests who convert are not "re-ordained")? Or must they be ordained all over again? Simply speaking: can they marry before being ordained to the Orthodox Priesthood. Or must they remain celibate? There is no single answer to this question and it is usually handled in a process known as ecclesiastical economy. That is, it depends at least upon the archdiocese, and in some cases on a local bishop or diocese. This issue depends in part on the greater issue of how much validity that bishop or archbishop or diocese might assign to Roman Catholic orders? The practice of the Orthodox on this issue has even been subject to change from time to time as well as place to place, often depending on situations appropriate to the setting. The Orthodox Church in America (OCA) is the offspring of the church in Russia and thus it has inherited much of its traditions from practices in Russia. In the OCA, Roman Catholic clergy generally are received into the Orthodox Church through "vesting"; that is, they are not ordained anew. There is evidence that this was in fact the practice in Russia several centuries ago. Thus the OCA at least prefers them to remain celibate and take monastic vows. ^ While rejecting this interpretation, Baptist scholar Benjamin L. Merkle considers it a possible interpretation, one that has several strengths and fits in with the value that the early church attached to celibacy after the divorce or death of a spouse (Benjamin L. Merkle, 40 Questions about Elders and Deacons (Kregel 2008 ISBN 978-0-8254-3364-1), 126). ^ Roman Cholij, Priestly Celibacy in Patristics and in the History of the Church. ^ Lea, Henry C. History of Sacerdotal Celibacy in the Christian Church. Philadelphia: University Books. 1966, pp. 118, 126. ^ Ridley, Jasper (1962). "Thomas Cranmer". Oxford: Clarendon Press. OCLC 398369. .
^ Father William P. Saunders, Straight Answers. ^ Encyclical Sacerdotalis caelibatus Archived July 1, 2007, at the Wayback Machine; Procurator General. ^ Wettinger, Godfrey (1977). "Concubinage among the Clergy of Malta and Gozo ca. 1420-1550" (PDF). Journal of the Faculty of Arts. University of Malta. 6 (4): 165–188. "Catholic Journalist Challenges Statistics on Married Priests". EWTN News, 20 April 2007. News report on statistics of Latin-Rite Catholic priests who abandon their ministry to marry, and of those who return.